One of my retail clients recently had a customer come in to her Massachusetts consignment shop and redeem a Google coupon that we created for her business! First off, the fact that a customer printed, cut and redeemed a paper coupon is a miracle in itself but also this customer found the coupon in the Google business listing while searching for one of our targeted keyword terms and that just tickles me pink. If you have no idea what I’m talking about you should probably read on. Like most businesses these days, my client has a limited marketing budget and wanted to spend all her resources online (smart woman!). And there is so much you can do online that is absolutely free. Yup, that’s what I said folks, FREE. Aside from social media, which is a whole different blog post (if not book), there is a ton of marketing you can do online that doesn’t cost a dime. But where to start you ask? Google, of course. 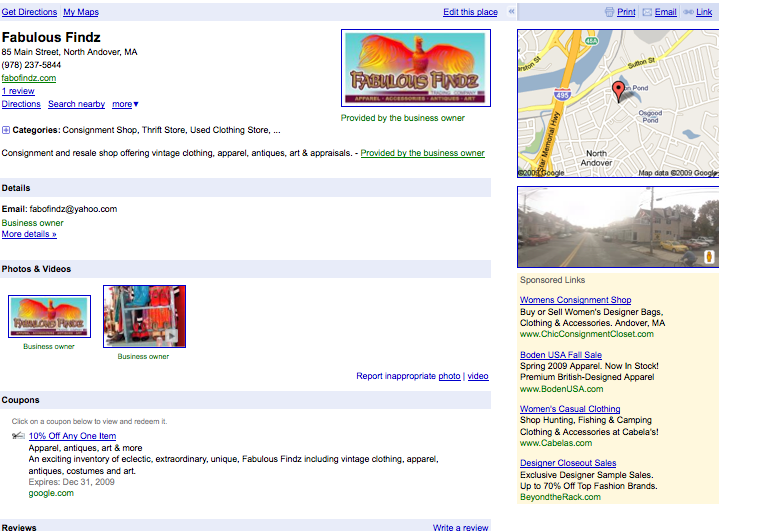 I can’t stress enough how important it is to list your business in the Google Local Business Center. Aside from the possibility to show up at the top of the fold on some pretty competitive keyword terms, you have the opportunity to further promote your business with coupons, photos, videos and product reviews. And all for the low, low price of…wait for it…nothing! Link to the coupon from your site or other sites, blogs, etc. If you have not yet listed your business in Google’s business listings. Stop reading this now and go do it. Just remember all listings are ranked on relevance to the search terms entered so, as always, make sure you write relevant content pertaining to your business. This is just one of the many free opportunities out there to further promote your business online. It’s just a matter of getting creative and utilizing all the tools out there effectively.